Thanks to the ability to transfer critters via a link cable, and later infrared, the core Pokémon games have always had a social aspect. Try as Nintendo might, though, this idea hasn’t extended much further than school playgrounds due to the franchise’s demographic. It pains us to say it, but there’s a slight stigma against playing Nintendo handhelds in public too. That’s unless it happens to be an original Game Boy, which in this day and age will doubtlessly earn extra hipster cred. Unkempt beard optional. Now Nintendo has finally embraced mobile gaming, Pokémon’s social aspects have become fully realised. All it took was moving their games away from their own hardware; who would have thought it? By featuring generation one ‘mon, Pokémon Go draws heavy on nostalgia to create something that anybody can play anywhere. There is no stigma in whipping your mobile out for a few minutes as if you were merely checking Twitter or seeing what year old memes have finally found their way onto Facebook. 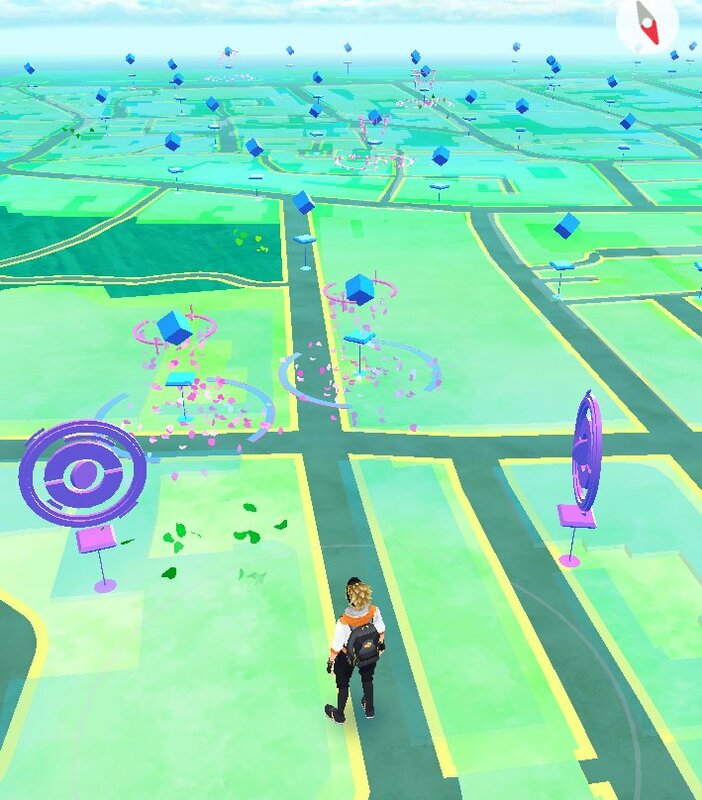 Perfectly suited for on-the-go-gaming, a few minutes is all it takes to load up Pokémon Go (servers permitting), catch a critter or two and grab some extra consumables from nearby PokéStops. With an attractive entry point of sweet nothing, Pokémon Go has become a worldwide sensation in just one week. This success can also be attributed to a simple core mechanic. It’s one that’s perhaps even a little too simple for its own good, bearing an uncanny resemblance to 2009 mobile hit Paper Toss. You still get to choose a starter Pokémon from a choice of three (or four – walking away from the trio of starters will eventually prompt a Pikachu to appear) but now that starter Pokémon is merely used to teach the basics. To wit: instead of battling Pokémon to whittle down their health bar, it’s now a case of flicking PokéBalls at your target in an attempt to hit them square on the noggin. Some Pokémon are harder to hit than others due to moving in unpredictable patterns and will occasionally bat away your balls (why, it’s almost as if they don’t want to be caught) but that’s it for variety, depth, and indeed tactics. On our ageing mobile the game is prone to stuttering, and even though we sometimes struggle to line up shots perfectly we’re still able to capture smaller Pokémon with just one attempt. It isn’t even a case of flicking and hoping for the best. Flick a few balls in the general direction of a Pokémon and one will eventually find the target. To say that the package as a whole is basic would be folly, however, as there’s a lot going on behind the scenes. By using GPS, your location is tracked in real-time and Pokémon appear accordingly thanks to some pleasingly logical algorithms. In residential areas you’ll come across Rattatas, Pidgeys and Spearow. As such, you can routinely find Pokémon simply while sat on the couch at home. Public parks include bug Pokemon such as Weedles, Venonats and Caterpies while water type Pokémon can, predictably, be found near bodies of water. Ghost types appear only at night; fighting Pokémon usually turn up at gyms, stadiums, and sports centres. 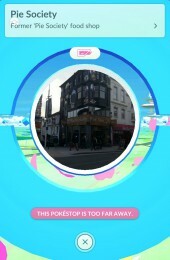 As for elusive Dragon types, you’ll have to head towards major landmarks. That’s to say, you’ll have to get off that aforementioned couch and go outside. This is what prevents Pokémon Go from being an otherwise middling experience; you’re actively encouraged from the outset to go outside and mingle with other players. 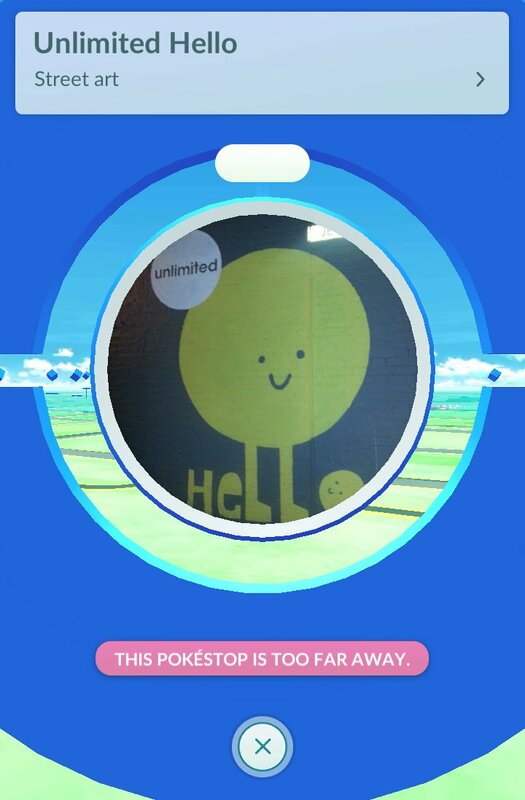 Local landmarks act as PokéStops where PokéBall reserves and eggs can be collected. Discovering what developers Niantic – an American studio, we might add, hence the rather westernised feel to the presentation – consider a local landmark is a joy in itself, with lots of public houses, murals and even the local YMCA showing up in our area. Ingeniously, players can attach lures to these locations that others can benefit from. More renowned locations meanwhile serve as gyms, accessible only once rank 5 has been reached. Here you can pit your strongest Pokémon in a short mini-game battle against other players, with the victor claiming that gym. It then falls to you and your team – of which there’s a choice of three – to protect that turf by assigning a Pokémon to do battle while you’re away, with the idea being to assemble a balanced line-up. Although we would have loved to have seen more interactivity within gym battles (Pokémon have just two attacks, further illustrating the overall simplicity) they still encourage players to seek stronger creatures or focus on evolving existing ones. Every successful capture earns XP, and due to the ability to trade-in duplicates there’s good incentive to capture Pokémon you already have. Trading Pokémon bestows candy and stardust – the two required ingredients for upgrading and evolving. As seasoned Pokémon players will know, even a mere Pidgey can become a beast to be feared. It’s the chance to go out and meet players – or at the very least observe others engrossed in the same pursuit as yourself – that raises Pokémon Go to another level. It’s an experience that fully supports exploration of the real world; to go to places you don’t usually go, in the hope of adding a new Pokémon to your Pokédex. Friendships, and perhaps even more, will be forged by this game. It’s in the weeks and months to come that Pokémon Go will reveal its true lasting appeal. As a free to play release that’s gained mainstream coverage, it’s safe to assume that new players will constantly be drawn in. It’s keeping existing players hooked that Niantic has to focus on. 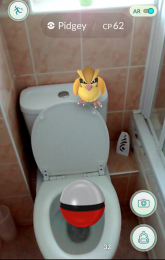 The ability to head to certain fast food purveyors to capture rare Pokémon may not be a big enough reason to keep that all-important PokéBall reserve well stocked. That said; never underestimate a Pokefan’s desire to fill up an entire Pokédex – a task that could very well take you from John o’Groats to Land’s End.